Oftengrumpy unless I'm knitting...: Happy Birthday Adam! My gigantic/little brother turned 22 this month. 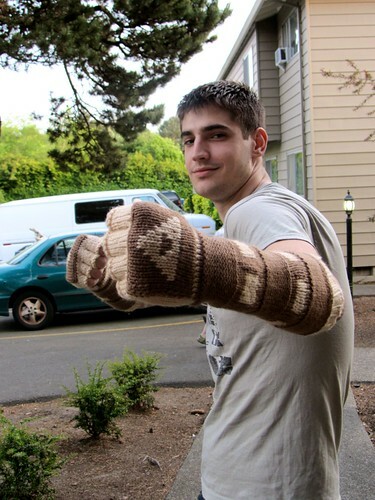 Naturally, I knit him his present. 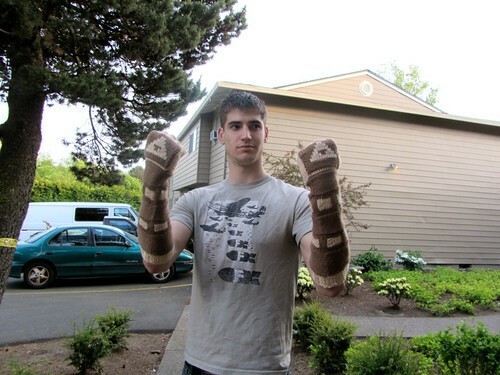 A while back I came across a pattern for triforce gauntlets and thought they would be the perfect blend of nerdy nostalgia for Adam. He seems to like them. The pattern, by Emily Hastings, is free on Ravelry. For those of you not familiar with one of the best videogame series of all time, the Triforce is from Zelda. If you haven't played Zelda, do, but be sure you have about 50 hours of free time you can afford to lose. I gave him that shirt on a previous birthday. I am an awesome sister. The yarn is nothing special. The brown is Red Heart Super Saver in Cafe Late and the tan is Vanna's Choice in Linen. Both are 100% acrylic. Adam is super hard on all his clothes/belongings and acrylic seems to stand up the best to his shenanigans. 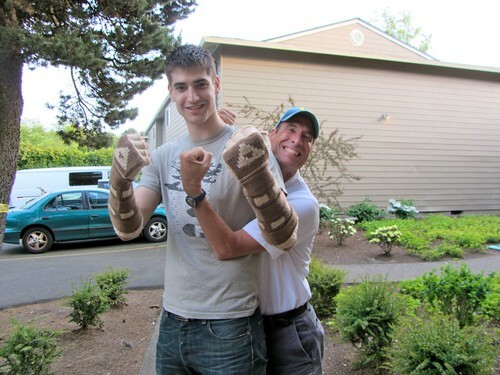 I know I've mentioned that my brother is a giant freak of nature but here's a little more proof. Above he is pictured with my dad who is 6'1". At 6'10" Adam is over a full head taller. Freak.